The story follows Elmer as he prepares with the other elephants for an annual parade in the jungle. The other animals complain about the noise and mess as all the elephants decorate themselves to be more colorful (only Elmer becomes 'elephant colored' on this special day). Elmer wisely decides to include everyone to quell this jealousy and soon all the animals of the jungle are happily participating in a colorful parade (with 'elephant' masks for the other animals, even). This digital offering is well made with simple, intuitive settings, although several do take the reader outside of the app. Like the other titles from Oceanhouse Media, this book has an eye on educational enhancements, too. For the read-a-long effect, each word is highlighted as it is read. Tap on any word to hear it spoken, even in the 'read-it-myself' mode. Overall, this is a truly inspiring read and just the right length for bedtime reading. It presents the topic with positive humor, beautiful illustrations and just the right amount of interactivity to inspire reading without detracting from the story. 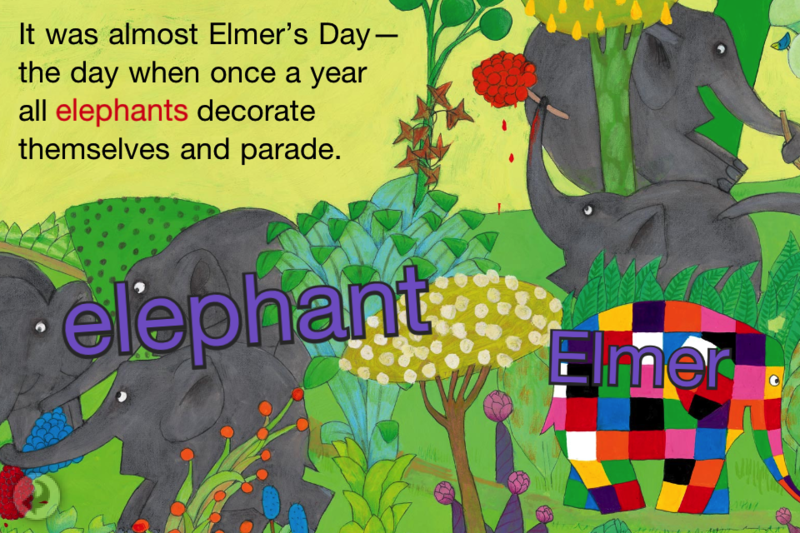 Elmer the elephant is a patchwork of colors, but one day a year all the other elephants decorate themselves to go on parade while Elmer makes himself grey and elephant colored instead. It's a noisy celebration, so noisy that it makes the rest of the jungle animals upset. So Elmer has an idea ... they will invite ALL the animals to join them this year for the parade. All they have to do is decorate themselves and wear elephant masks. The parade is a huge success and no one complains about the mess and noise.